Txt-Me-1st was created as a follow-up work to Justin Wong’s Typing Machine (Junk Mail Factory) (2007) for the Writing Machine Collective to be shown as part of Digit@logue exhibition at the Hong Kong Museum of Art. A spam factory made from old typewriter parts physically and digitally reworks your SMS messages before returning scrambled versions to your mobile phone. Txt-Me-1st is a an interactive environment where visitors can create their own spam message by sending a SMS text with their mobile phone to a “machine” installed inside the museum. 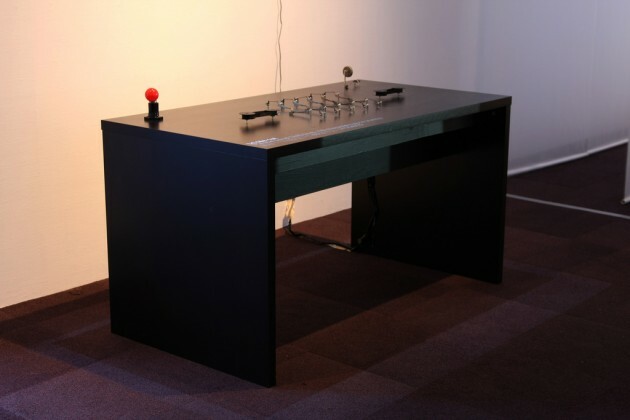 The machine comprises different old typewriter’s parts and a computer program that turns the incoming text into a spam message through a series of physical interactions and computational algorithms. After the final text is generated, it will be sent back to the visitor’s mobile phone. Txt-Me-1st is a response to the generative process of spam messages we receive daily. While people try hard to prevent them to enter their mailbox, there is much creativity in the way how spam messages are composed in order to avoid from being caught by anti-spam program. The most common methods are the use of misspelled words and trimming down of whole sentences into keywords only. The final messages often end up with sentences that look completely random and fragmented but are yet readable to a certain level. Txt-Me-1st is inspired by the evolution of this new writing method. 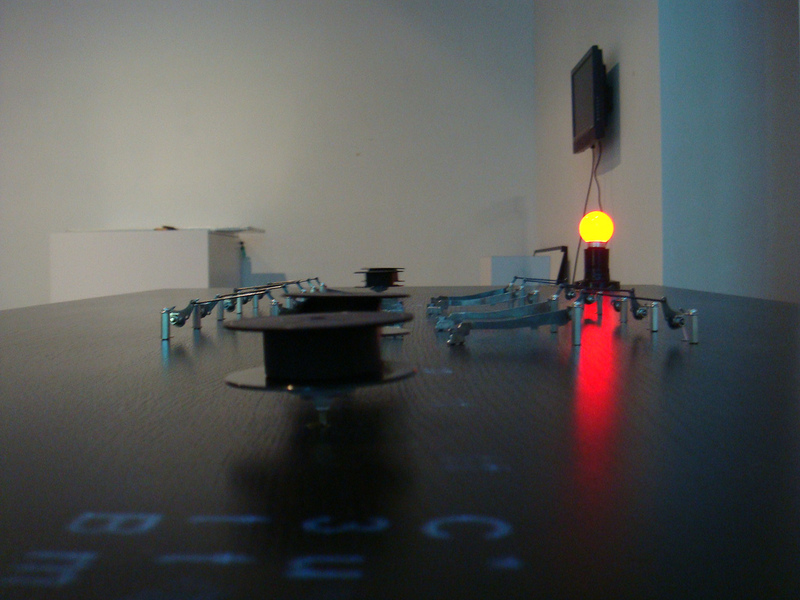 It shares a lot of similarities with some early text-based new media art in terms of the “randomness” and “emptiness” revealed in the works. It also reminds us of the playful and the rebellious nature in DaDa’s phonetic poetry in the early 20th century. Txt-Me-1st tries to adopt a similar approach which also highlights the emptiness and nonsense found in the writing process in the computer age. 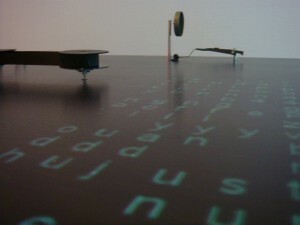 By implementing the influence of the ambient environment and the interactions between digital text projection and the old typewriter’s mechanical arms, visitors are witnessing how their message is decomposed and recomposed as if they are visiting an underground factory producing pirate DVDs. 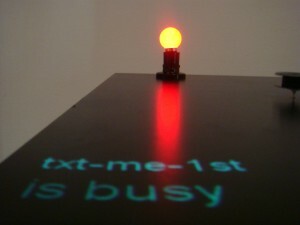 Txt-Me-1st can be seen as an experience generator rather than just a computational machine that writes on its own. It tries to emphases the playful experience between writing (sending text message) and reading (receiving spam message). It is also experimenting a new way of audience participation by turning the museum into a remote factory which allows the audience to take part in the work even if they are not on site. While everyone is busy installing anti-spam software, we can now create our own spam message. 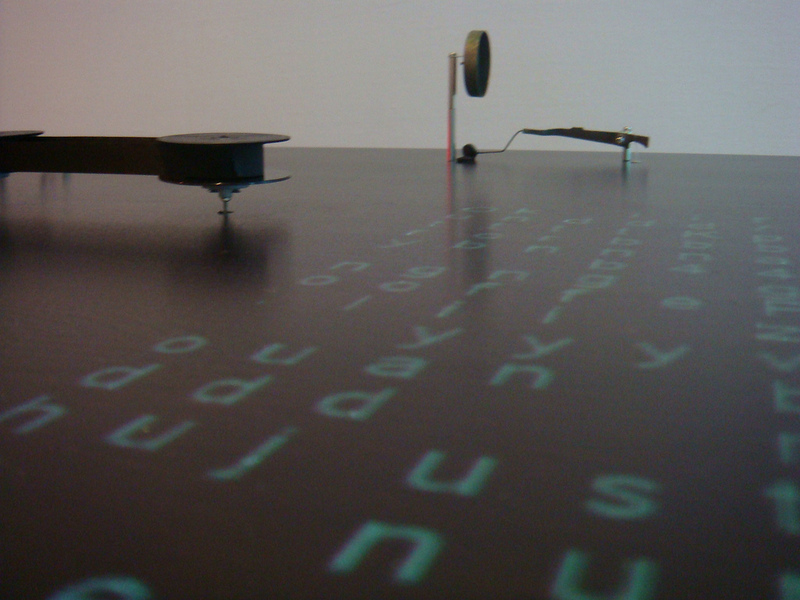 Txt-Me-1st consists of a desk that has typewriter arms, typewriter ribbon spools and a typewriter bell mechanism mounted onto it’s surface. A projector hanging from the ceiling displays white characters onto the dark desk. At a remote site a mobile phone receives the visitor’s SMS messages and communicates them to a Processing patch running on a desktop computer. The applet processes the message, creates the visual output and sends corresponding control commands to the Arduino platform that is hidden underneath the desk table top. 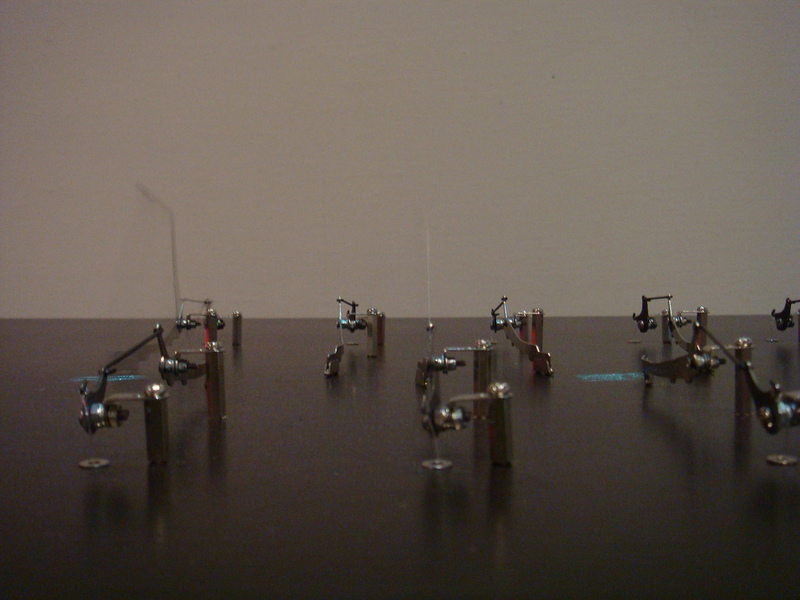 The microcontroller controls 4 stepper motors (to activate the ribbon spools that act as conveyor belts for the digital characters) and 11 solenoids (for 10 typewriter hitting arms and 1 bell hitting mechanism). 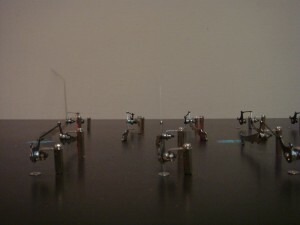 Posted in Projects and tagged 2008, Arduino, phone, processing, solenoid.